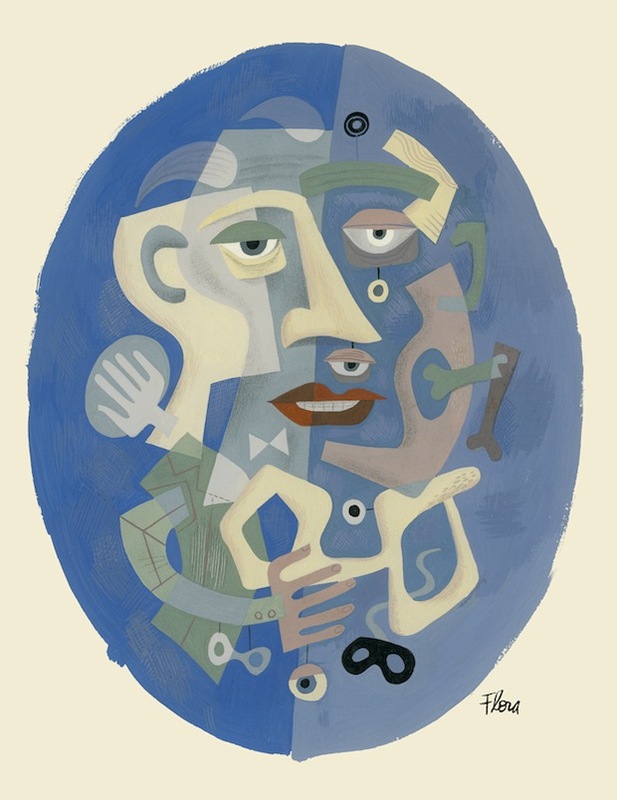 Artist Jim Flora (1914–1998) pulsed with the beat of mid-20th-century pop culture, then, later, showcased the diversity of his talents by producing children’s books and portraits with nautical themes. From hepcat album covers to cool modern art, he simply signed his vibrant works “Flora.” Rediscovered in the 1990s, Flora still sported his 1950s hip look, with a black turtleneck and slicked duck’s-tail hairdo undiluted by his quiet Connecticut surroundings. Flora got an early start in commercial art. While a student at the Art Academy of Cincinnati, he met writer Robert Lowry, and in 1938, the two started Little Man Press, producing limited edition publications. After marrying artist Jane Sinnicksen in 1941, Flora got a job with Columbia Records in Bridgeport, Connecticut. Flora and his wife moved to Westport, before settling in Rowayton in 1945, where they raised five children. After Alex Steinweiss invented the record jacket at Columbia, Flora hit his stride. 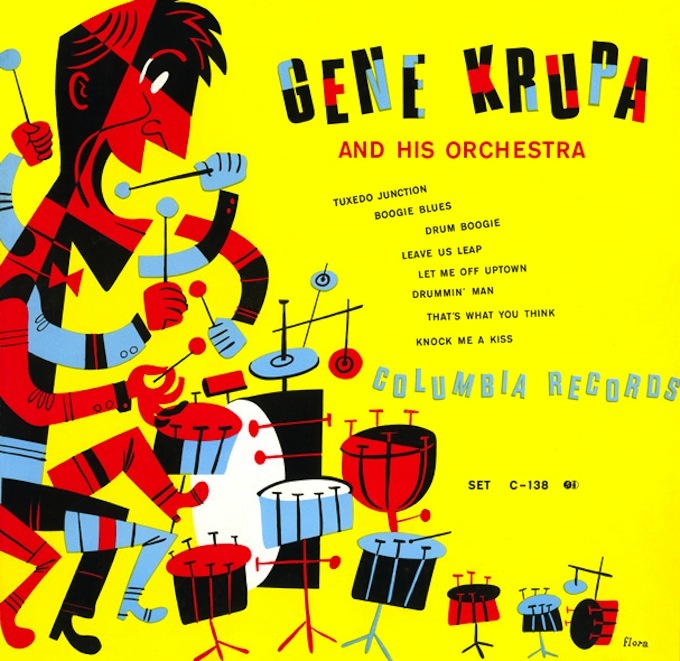 He designed dozens of album covers for jazz greats, including Louis Armstrong, Bix Beiderbecke, Benny Goodman, and Gene Krupa. 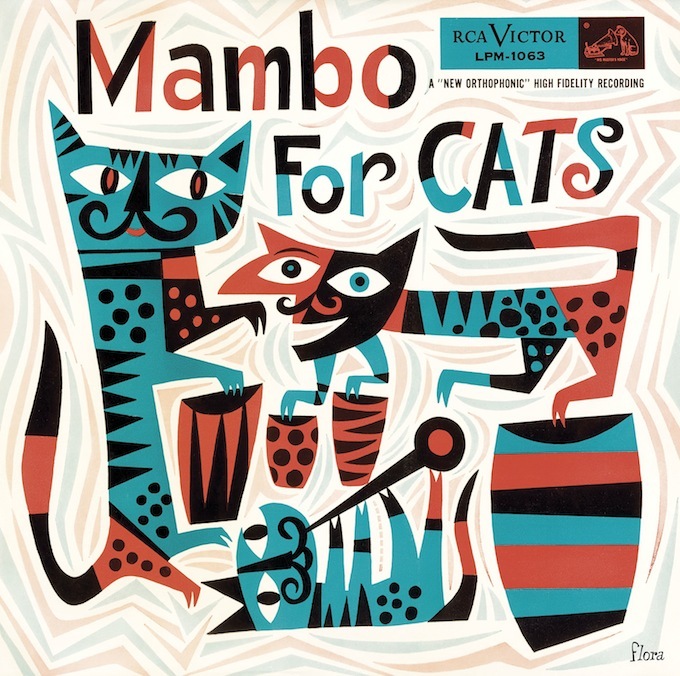 For RCA Victor Records in 1953, Prez Prado and His Orchestra got the classic Flora cover Mambo for Cats, with its beatnik felines created from flattened, simplified, jagged planes of color. It is still among Flora’s most popular images. Yet changing tastes tossed Flora into new arenas. He created covers and interior illustrations for the magazines that documented American life, such as Fortune, Holiday, Life, Look, Newsweek, The New York Times Magazine, Mademoiselle, Sports Illustrated, and Collier’s. He also took occasional work as an art director and dabbled in early animation with United Productions of America. From 1955 to 1973, Flora illustrated 17 children’s books for Harcourt Brace and Atheneum Books. Enchanted Lion Books recently reprinted Flora’s second children’s book, The Day the Cow Sneezed, from 1957 and the fifth book, Kangaroo for Christmas, originally published in 1962. 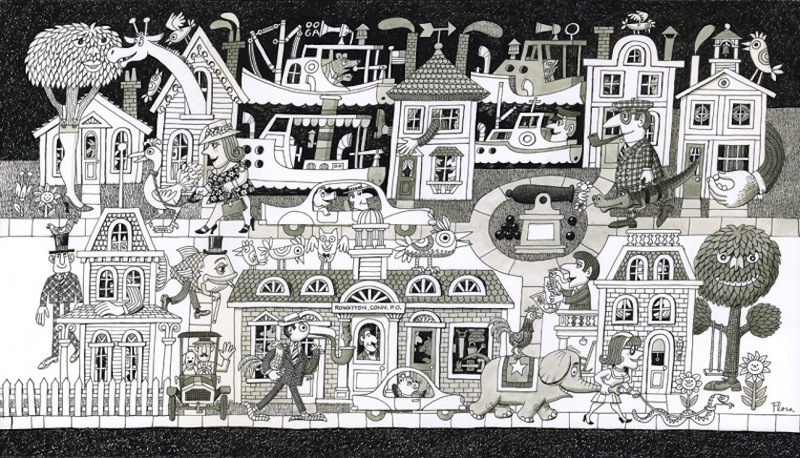 Inspired by Rowayton, Flora illustrated dozens of scenes of the town. The playful portrait Rowayton Creature Tableau is typical of Flora’s 1970s style featured in his children’s books. Silly, playful abandon meets childhood nostalgia, resulting in a cleaned-up version of his more adult imagery. After years of obscurity, Flora’s reputation has been resurrected. Designers, illustrators, animators, and artists connect to his seemingly effortless style. Flora once reflected that all he wanted to do was “create a little piece of excitement.” He still does with his seemingly simple, “retro-chic,” hyper-expressions of American life.